Seven Jewish Children - The CST have branded this play antisemitic, watch it and judge for yourself. I had close personal experience of the role the Mossad played in establishing Israeli hegemony over the monitoring and combating of antisemitism. 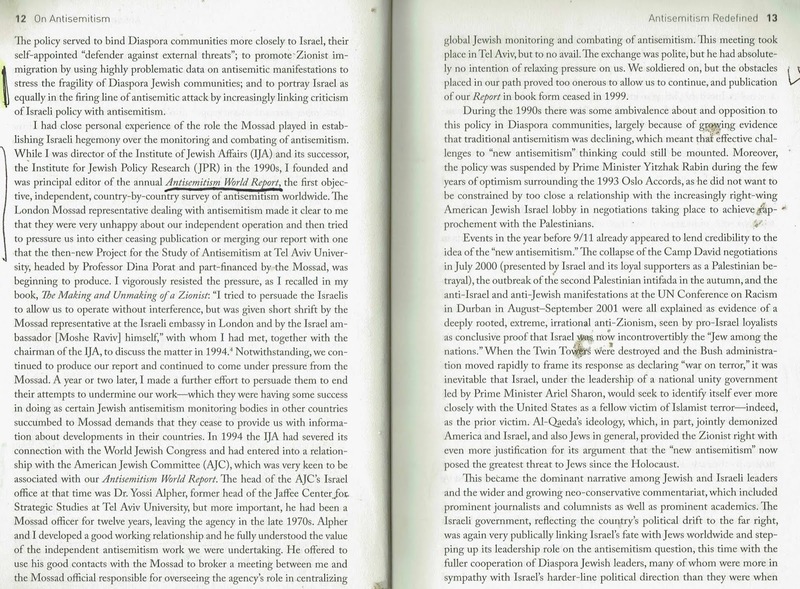 While I was director of the Institute of Jewish Affairs (IJA) and its successor, the 'Institute for Jewish Policy Research OPR) in the 1990s, I founded and was principal editor of the annual Antisemitism World Report, the first objective, independent , country-by-country survey of anti semitism worldwide. 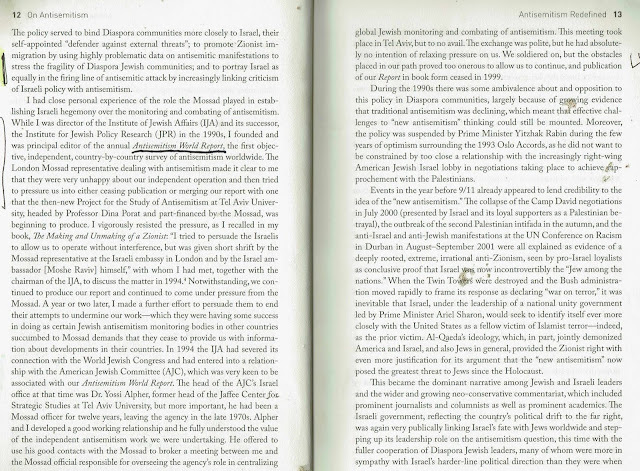 The London Mossad representative dealing with antisemitism made it clear to me that they were very unhappy about our independent operation and then tried to pressure us into either ceasing publication or merging our report with one that the then new Project for the Study of Antisemitism at Tel Aviv University, headed by Professor Dina Porat and part-financed by the Mossad, was beginning to produce. [On Anti-Semitism, p.12]. What you ask is Mossad, Israel’s equivalent of MI6 or the CIA doing in charge of monitoring statistics about anti-Semitism amongst the Jewish diaspora? What relationship does an intelligence service have to a question of racism unless it is engaged in Black Ops? The only logical explanation for why Israel muscled in to take over something that clearly has nothing to do with them is because the inexorable ‘rise of anti-Semitism’ has become a Zionist theme whose counterpart is that only the ‘Jewish State’ is safe for Jews. Further anti-Semitism is and has become a weapon in the fight against anti-Zionism, BDS and support for the Palestinians. Indeed the irony of the current ‘anti-Semitism’ campaign is that Jews should do what the anti-Semites want – which is get the hell out of the countries they live in. There is no other explanation. It is the prominence of ‘anti-Semitism’ that explains the sudden appearance from nowhere of groups like the Campaign Against Anti-Semitism. The CAA arose amid Operation Protective Edge, Israel’s genocidal attack on the Gaza Strip. 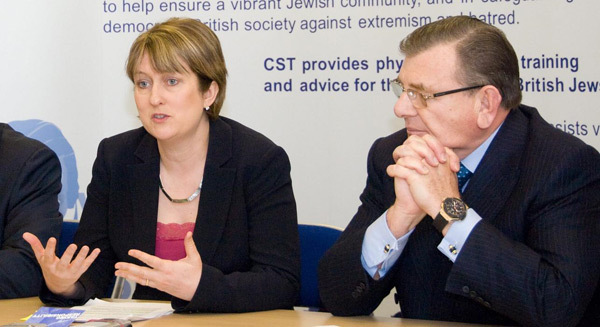 The CST has had the responsibility of compiling statistics of anti-Semitism in Britain. They have been careful not to overplay their hand. That is why they reject many complaints of anti-Semitism. This has ironically meant rejecting in practice the IHRA definition because this would make it too obvious that they are engaging in statistical fraud. This despite their support for the IHRA politically, as befits a Zionist organisation. They have done this because they know that once their statistics match the IHRA definition, i.e. that any manifestation of anti-Zionism equals anti-Semitism their statistics would lose all credibility. Nonetheless the CST has massaged the figures, highlighting social media anti-Semitism (which could be infinite since a single individual can post thousands of ‘anti-Semitic incidents) as well as providing an elastic and fuzzy definition of what constitutes anti-Semitism. The CST’s figures show an almost inexorable statistical increase year on year, thus feeding into the myth of increasing anti-Semitism. They depend on self-reporting and thus the perception of the ‘victim’. There is no way of judging whether the reports are true or false since the vast majority never result in prosecution or conviction. There has also been a continual and marked divergence between their statistics and those of the Police. Of course the CST are not in the same league as the CAA whose venture into the field of anti-Semitism statistics bear a distinct resemblance to the adventures of Inspector Clouseau minus the humour. This is documented Eve Tyktyn’s ‘Exposing the Vigilantes’ in The Anti-Semitism Wars, 2018, Skyscraper Publications, pp. 115‑138). 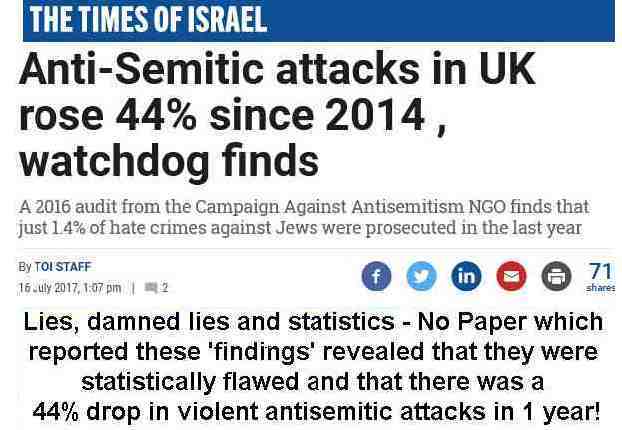 Tyktyn documents how the CAA’s 2016 grandiosely titled ‘Anti-Semitism Audit’ (which was anything but) managed to produce a 14.9% increase in ‘anti-Semitic crimes’ yet at the same time, buried at page 6 of a 73 page document, it reveals that there was a 44.7% drop in violent anti-Semitic attacks. Their only explanation is that ‘It seems that the drop in 2016 might be a correction to the spike in 2015 and not part of a trend’ Unfortunately or fortunately this is not true. The drop in violent anti-Semitic attacks continued to drop into 2017. The CAA of course ruled out the most obvious explanation, which is that there was no increase in anti-Semitic incidents and that their report was, to put it bluntly, a load of crap. The CAA, since it doesn’t have access to each Police force’s statistics and since there are no national records ‘solved’ this problem by asking each force to conduct a key word search in their files using ‘Jew’! Northumbria force, which described the whole exercise as a ‘fishing expedition’ warned the CAA that not ever mention of ‘Jew’ or ‘Jewish’ is in connection with an anti-Semitic incident but the CAA ploughed on regardless. The result is an ‘audit’ which has no statistical or methodological credibility. So in Derbyshire there was a rise of 1050% in anti-Semitic incidents. Tykytyn asks whether a pogrom occurred in Derbyshire that year. In fact the number of such incidents increased from 2 to 23 and as the Police explained, the change was due to a difference in how they record incidents. Not that this stopped the CAA from including these flawed statistics. The same level of increase was true for Hertfordshire and West Yorkshire. Wiltshire’s 514 Jews seem to have endured almost Nazi levels of persecution. There was a 13,900% increase in anti-Semitic incidents! Even the CAA realised that something was amiss and decided exclude Wiltshire entirely from their ‘audit’! However although the CST’s use of statistics isn’t as obviously slapstick as the CAA’s it is still deeply suspect. For example their Anti-Semitic Incidents Report 2018 show an increase of 16% from 2017, 1,652 as opposed to 1,420 incidents last year. An increase of 232. But 23% of these (384) were social media posts, an increase of 59% (249) over last year. In other words 135 of the 232 increased incidents were from social media. This is completely absurd. I’ve probably come across 100 incidents alone of social media anti-Semitism or Holocaust denial. How can you possibly measure social media anti-Semitism and more to the point is it really comparable to face to face verbal and physical anti-Semitism? No one has ever died from a tweet or a Facebook post. Anti-Semitism used to be being hit over the head or stabbed with a knife. Now it is being offended by some idiot’s Twitter meanderings. If CST had any self-respect they would strip out social media anti-Semitism entirely but that would not serve its purposes. Like the CAA, hidden away in their statistics is the admission that ‘CST recorded a 17 per cent decrease in the number of violent antisemitic assaults, from 149 in 2017 to 123 in 2018. One of these violent incidents was classified by CST as ‘Extreme Violence’, which means it involved potential grievous bodily harm (GBH) or a threat to life.’ Yes that’s right – a 17% decrease in violence. Now verbal abuse, however defined is not pleasant, although it is also subjective (was it about Israel?) but the anti-Semitism that really counts is when someone hits you over the head with a cosh. For the previous two years there have been NO extreme acts of violence. This year there is one, which I guess means that statistically there has been an infinite increase! Or to put it another way, at a time when stabbings and killings of Asian and Muslim people are only too common, just one Jewish person in 3 years has been the subject of a violent anti-Semitic attack. What is interesting is that of the 1652 alleged anti-Semitic incidents, just 123 i.e. 7.44% were violent. For other ethnic minorities violence usually forms from between a quarter and one-third of all racial incidents yet in the case of Jews it would seem that the number of violent attacks is shrinking as a percentage of overall incidents, down from 10.5% last year to 7.44% this year. It would seem that the CST is extremely good at documenting false and padded out statistics but there is one area that they cannot fake the stats and that is where there is actual violence. The Community Security Trust cites the racist Hebrew University Professor Raphael Israeli to denounce the ‘anti-Semitism’ of Sheikh Raed Salah. For the second year running the government is to fund the CST - Community Security Trust, a Zionist vigilante group often referred to as the the private militia of the Board of Deputies of British Jews, to the tune of £48,869, last year it was also given £54,354, the money apparently comes from the Hate Crime Victims' Fund! According to the charity commission, the CST has an annual income of just under £6 million (2009), and has assets of over £10 million. CST founder and chairman Gerald Ronson, also founder and Chief Executive of Heron International Plc ('one of Europe’s leading property investment and development companies'), has donated nearly £400,000 over the past three years to the CST through his foundation (other recipients of the foundation include the Jewish National Fund, United Jewish Israel Appeal, New Israel Fund, Women`s International Zionist Organization and a charity to help Israeli war veterans). Gerald Ronson is a convicted fraudster (Guinness share-trading fraud). Interestingly the Jewish Telegraph reports that whilst Gerald Ronson was in prison, Israel's Prime Minister Yitzhak Shamir was "desperate to speak to him in prison". Now out of prison it reports he dines with "Britain's top police chiefs". 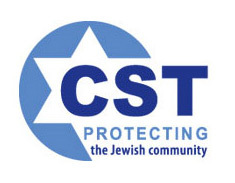 The CST is essentially, on one level, a private security contractor called upon to provide security at all pro-Israel activities from demos, conferences, fund-raisers, and to protecting the odd visiting Israeli war criminal. It has three offices and employees 69 people with an additional 3,000 trained CST troops ('volunteers') on call. Apparently the CST 'mainly consists of ex-Israeli security personnel'. The CST also give combat training (self-defence) to 12,000 Jewish youth a year(2008). The CST has a special relationship with the Metropolitan police, it receives its training from them and is granted special privileges during the policing of demos, etc. Whilst stewards and legal observers from the pro-Palestine side of a demo are not allowed to cross the police lines to approach Zionist side, the CST which stewards the Zionist side are free to cross the police line and approach the pro-Palestinian side to intimidate, take photos, etc. The CST has a particularly brutish reputation, especially in dealing with anti-Israel protesters at pro-Israel events. Their special relationship with the MET means they have not been brought to book for their thuggery. 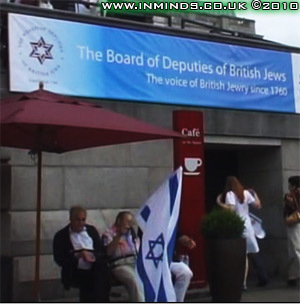 In January 2009, during the Israeli slaughter of children in Gaza, the Board of Deputies of British Jews who claim to be "the voice of British Jewry" - in reality the voice of Israel in the UK, held a rally in Trafalgar Square in support of Israel, essentially a celebration of genocide. The CST provided the security for the event. One brave young Jewish man, Dovid Von Neumann, interrupted the Chief Rabbi Sacks pro-Israel rant with a Jewish children's song, highlighting how Israel has perverted a line from a Jewish children's poem about a spinning top which were traditionally cast in lead to name their military operation "Cast Lead" which murders Palestinian children. He was pushed into the frozen fountain and stoned him with lumps of ice, then the CST thugs smashed his megaphone and dragged him out of the fountain throwing him on to the pavement. The police did nothing to arrest his assailants - the CST, instead they incredulously detained the victim for several hours before they were forced to release him without charge. In December 2009 when the CST was providing security to a JNF conference, the Israeli ambassadors speech was interrupted by two protesters. The Jewish Chronicle reported the protesters were "punched and kicked" and dragged out of the conference, again the assailants went scot-free. 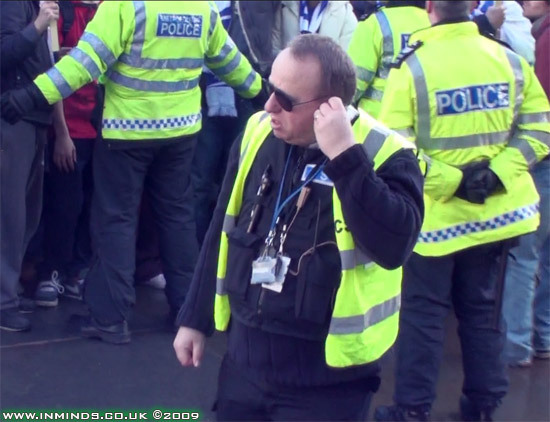 On February 9th 2010 the CST provided the security for the "Israel: Blue White and Green" seminar at the Institute of Education (IoE). The seminar attempted to 'greenwash' the occupation, its key note speaker David Bellamy didn't turn up after receiving many letters urging him to boycott the 'greenwash'. During the questions session a Jewish member of the audience asked a critical question about Israel's role in depleting Palestinian water resources, he was prevented from finishing the question and was "carried out bodily by members of the CST and denied re-entry". When another member of the audience, a woman this time, wished to put a question on Israels denial of water to Palestinians as outlined in the Amnesty 2009 report she was "physically dragged out of the meeting by members of the CST. “I was frog-marched up the stairs”, she said afterwards. She later telephoned the Institute of Education to complain about the treatment she and her fellow activist had received, and received an apology. “From the reports the IoE have received from their own staff, they seem to feel that the level of restraint used by the CST was inappropriate for the situation", she said. The two ejected activists are considering taking legal advice." It seems after every massacre the Zionists hold a celebration, like the celebration after Gaza in 2009, in 2002 after Jenin the Israel Solidarity Committee organised a celebration 'Stand Up For Israel'. 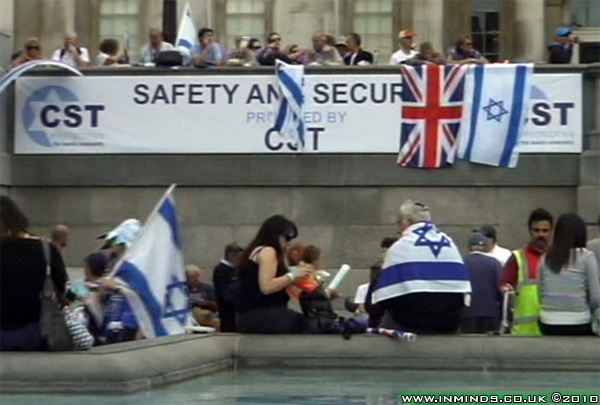 Funded by the United Jewish Israel Appeal(UJIA), the celebration was held in Trafalgar Square with the CST in charge of security. It was a particularly ugly event with an elderly anti-Zionist Rabbi in the counter-demo being punched in the face whilst police officers two metres away stood by and did nothing. After the rally Zionist gangs roved the streets attacking Muslims with impunity, easy visible targets being women with hijab - several were attacked. Even the Saudi ambassadors son was attacked by a Zionist mob. Both the MET and the CST were castigated for their roles. The IHRC report on the 'partisan' policing of the rally with eyewitness statements is particularly damming. It reveals that whilst the police prevented Muslims from approaching the Zionist rally and even helped the CST eject any Muslims found in Trafalgar Square, they at the same time allowed free movement for the CST and other Zionists to approach, even walk through the counter demo draped in Israeli flags, and ultimately attack its speaker, Rabbi Grohman, whilst he was addressing the counter-demo. The thug was simply allowed to walk through two police lines unchallenged to carry out his assault. The Jewish Chronicle reports that the Muslim Lawyers Committee complaints against the police included charges against the CST, one, the police's 'failure to prevent assaults against Muslims by CST officials' and two, 'the intimidation of Muslim women by CST officials'. The latter may be a reference to an incident where some Muslim women in hijab were enjoying a friendly conversation with some Arab Jews from Iraq in Trafalgar Square when suddenly they were surrounded by 'blue caps' - CSTs, who forcefully separated the Muslims from the Jews and with police help removed the Muslims from the Square despite protests from the Iraqi Jews. In June 2008 when Zionists celebrated 60 years of the ethnic cleansing of Palestine, over 500 CST were mobilised on to the streets of London. The CST were providing security for a parade of floats starting on Piccadilly, down Haymarket to culminate in a rally in Trafalgar Square. The CST in the black flak jacket and professional communications kit is in charge of a unit of volunteer CSTs (blue caps). Member of the Jewish Police Association with CSTs helping give out whistles during Israels 60th anniversary parade. Moments after this photo was taken of the police van behind the float sponsored by the Jewish National Fund, the CST man pointed the cameraman out to the police officer who then, accompanied with the CST, challenged the cameraman asking whether he had a permit to film as the parade was a restricted area. When the cameraman, looking around seeing dozens of other people freely filming and photographing the parade at that very moment without being harassed, asked what permit was required to film in Piccadilly? He was shown a CST 'contractor' badge which the police officer was himself wearing around his neck and told this is the permit that is required! When the cameraman ridiculed this absurdity the police officer told him to wait whilst he checked with his superior in the police van, emerging minutes later grudgingly accepting that 'on this occasion' no permits were required to film on a public road in London. An example of racial profiling and harassment by the police at the behest of the CST. An important question remains - what was a MET police officer doing wearing a CST Contractor badge around his neck - if he was not on police duty and was contracting for the CST he shouldn't be in police uniform, if he is on duty then he shouldn't be wearing the CST badge - who is he working for? The other CST badges on display on the day were the 'security' badges worn by the CST volunteers. For the rally at Trafalgar Square, the CST set up its own checkpoints (at least four were set up). Using police barriers the CST blocked all approaches to Trafalgar Square. They created separate gates for people entering and for people leaving the vicinity of the Square, so for example a tourist wishing to visit the National Gallery, which is adjacent to Trafalgar Square, would have to go through at least one CST checkpoint. Two police officers were positioned near each checkpoint (yellow circle) specifically for this task. Its seems the Zionists, accustomed to building checkpoints on other peoples land in the West Bank, are now doing the same in London with impunity. Everyone entering was questioned by the CST and their bags were checked before being allowed to pass. If the CST weren't happy with someone they would call the police to remove them. This cameraman, having succeeded in circumventing the checkpoints and enter Trafalgar Square was then hounded by CST 'minders' for the whole duration of his stay in Trafalgar Square. On two occasions they called on the police to remove the cameraman but this time the police were reluctant to enter the Square and drag someone out for no reason. They would however, on CST request, prevent someone from entering the Square. So the CST told the cameraman that the police officers wanted a word, if he would follow them to the checkpoint where the officers were. The cameraman declined, if the officers wanted to talk they should come to him. He later found out that another cameraman had been forcibly removed from the Square, near a checkpoint, by the police and 'stopped and searched' because he was 'caught' photographing the CST, which apparently was reason enough for the police to act. Next the CST tried a different tactic, they coaxed an elderly Jewish woman to block the camera lens of the cameraman every time he went to use it, in the hope of eliciting a response which could be used as pretext by the police to remove him. The old woman was so clumsy she ended up annoying the other pro-Israelis in the crowd, nearly poking one persons eye out, hitting another's head with her flag pole, and pushing a child dangerously from behind. After people got upset with her the CST had to call her off. Even after the event, when the cameraman had left the Square to go home, the CST still continued hounding him - pointing him out to the police officers requesting they stop and search him. By this stage even the police had had enough and refused. 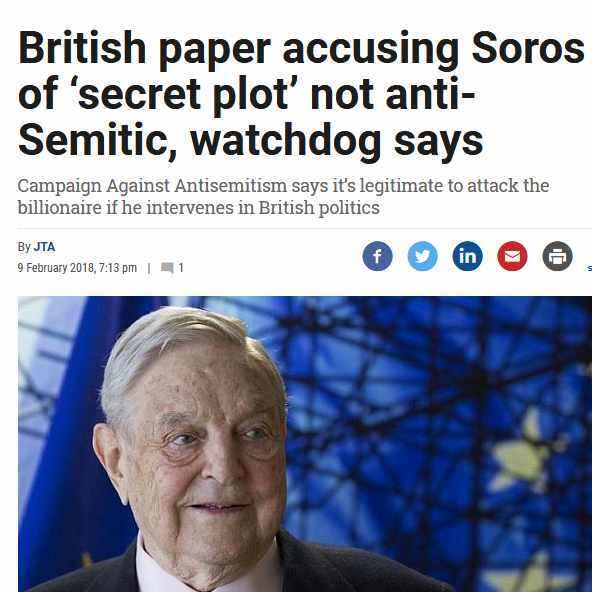 A major part of the stated work of the CST is to collect, analyse and publish statistics relating to antisemitic figures. Its annual Antisemitic Incidents Reports are used by the media, academic bodies, law enforcement and the government as the basis for policy making. According to the CSTs Director of Communications, Mark Gardner, their figures on antisemitism are "acknowledged by police and government as being more accurate than the police’s own figures." Yet experts on antisemitism in the Jewish community, like Antony Lerman who headed the Institute for Jewish Policy Research for nine years and served on the Runnymede Trust's Commission on Antisemitism, and interfaith activist Rabbi Herschel Gluck, have themselves attacked the CSTs figures suggesting the CST "bumps up" the figures on anti-Semitic attacks thereby stoking up paranoia within the community. Cynics suggest that such paranoia helps generate revenue for the CST, an organisation whose raison d'etre is antisemitism, which for a charity is remarkably well funded with an annual income of around £6 million, affording to pay its top half dozen employees over £60,000 each, with the top spot getting over double that, up to £150,000 in 2008. Apart from the CST being "disingenuous in the presentation of data" Antony Lerman has also critised what the CST classifies as being antisemitic. Lerman points out that the European Monitoring Centre on Racism and Xenophobia(EUMC) working definition of antisemitism which the CST uses to determine what is antisemitism "contains highly contentious examples of when critical discourse on Israel is antisemitic. This is one of the unfortunate consequences of the mistaken but commonly-held notion that anti-Zionism is the 'new antisemitism'." According to the EUMC working definition of antisemitism "claiming that the existence of a State of Israel is a racist endeavor" or "drawing comparisons of contemporary Israeli policy to that of the Nazis" can be regarded as manifestations of antisemitism! So according to the CSTs warped definition of antisemitism this placard from a recent demo could be regarded as antisemitic on several levels. Firstly equating Zionism with racism suggests that the "existence of a State of Israel is a racist endeavor" hence antisemitic, secondly showing a photograph of Jewish Defense League (JDL) graffiti "GAS THE ARABS!" sprayed on a Palestinian home in Hebron could be construed as "drawing comparisons of contemporary Israeli policy to that of the Nazis" hence antisemitic. Interestingly the graffiti itself, calling for the gassing of a semitic people would not fall foul of CSTs definition of antisemitism (because its Arabs not Jews who are to be gassed), but to show the photo of it - to show Zionist racism is a problem because of its similarity to Nazi racism! Calling for a boycott of Israel is also, according to the CST, problematic as it "leads to antisemitism". The CST, under the cloak of fighting racism i.e. anti-Semitism, also forms a formidable lobby for Israel and is wheeled out whenever Israel is criticised. For example, the CST have attacked award-winning principled journalist John Pilger for what they refer to as his "feverish rhetoric against Jews", thereby painting him as an anti-Semite, and they attacked the new Statesman for publishing Pilgers articles, pressuring it to censor him, or as they put it "moderate or edit his rhetoric". Their claims against him are of course utter nonsense - their reasoning goes Zionism shouldn't be attacked because "large numbers of Jews" choose to be Zionists (their word is "self-define") so "if Zionism is depicted in exclusively hateful terms, then all Zionists will be hated" hence Pilger must be an anti-Semite! When the Channel 4 Dispatches programme did an expose on the Israeli Lobby funding of the Conservative Party, the CST was again wheeled out to condemn it, saying the programme was "playing up to antisemitic stereotypes". Caryl Churchill's 2009 acclaimed play 'Seven Jewish Children' upset the Zionist establishment. The 10 minute play consisted of seven short scenes marking seven moments in Israeli history from the Holocaust via the first intifada to the present day. Having been written during Israels attack on Gaza the play is critical of Israel, this was unacceptable. So once again the guns of the CST were brought out. Two of its most senior employees, Dave Rich and Mark Gardner branded the play antisemitic in a Guardian comment piece titled "The blood libel brought up to date", saying the play 'resonates' with antisemitism. In case people didn't get the message, the Zionist anti-boycott lobby 'Engage' within hours ran a piece titled "When the CST say 'Seven Jewish Children' is antisemitic, it is time to take the charge seriously". The fact that a Hebrew production of the play ,performed in Rabin Square in Tel Aviv to audiences of hundreds of Israelis, received positive responses didn't matter. Antony Lerman, who served on the Runnymede Trust's Commission on Antisemitism, ridiculed the CST charge as "utterly unconvincing" and stated that "the fight against antisemitism gains nothing from trying to turn the play into an antisemitic incident. All that's achieved is a further slide down the slippery slope towards rendering the word antisemitism meaningless." "This dinner has a very clear purpose: to ensure that the CST can carry on protecting the people and events that we know are potential targets. Carry on monitoring those who would harm this community." "During protests against the conflict in Lebanon, we witnessed the nauseating sight of well-scrubbed, middle class English people marching through central London holding placards that read 'We are all Hizbollah'. That is the extremist mindset in action. These are the same people who urge a boycott of Israeli goods and academics.. ..while saying nothing about China, Iran or Zimbabwe." In the past activists have requested the CST, under the Data Protection Act, to release the files it holds on them. The CST has rebuffed them by insisting they provide personal details like their home address, which would compromise their family's security, before considering the release of the files. This contrasts sharply with CST's own practice of hiding the names of its trustees. The Charity Commission confirms "this charity has been given a dispensation by the Charity Commission from publishing the names of its trustees", this is highly irregular for a charity. In July 2002 former Home Secretary David Blunkett affirmed that the CST and security services engage in 'intelligence sharing'. The Islamic Human Rights Commission in May 2009 published a damming report outlining how CST publications demonise Islam and Muslims. The report is available here. So rather than fight racism, which the CST claim they are doing, the report shows they are actually contributing to the racism against the Muslim community, and ironically the government are funding it through the 'victims of hate crime fund' for the second year running. If the Evening Standard is to be believed, even the Mayor of London Ken Livingstone, in 1984, referred to the CST as "paramilitary groups which resemble fascist organisations", put together by the Board of Deputies of British Jews. From an article by Tony Greenstein, it gives right of reply to CST spokesperson Mark Gardener. In Mark Gardener's reply he raises other issues in the article but does not challenge this assertion that the CST "mainly consisting of ex-Israeli security personnel". 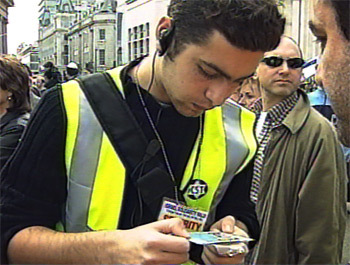 The Jewish Chronicle 19th April 2002 stated that UJIA (United Jewish Israel Appeal) was the main funder of the event.